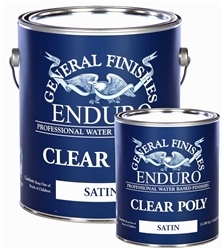 General Finishes Enduro Clear Poly is a high solids, optically clear finish well suited to spraying applications requiring a durable & non-yellowing topcoat. Clear Poly is a high solids, quick drying finish that can be used directly on bare wood or on stained surfaces. Non-Yellowing properties of Clear Poly makes it an excellent choice for a protective clear coat over painted or tinted poly surfaces such as MDF or paint grade cabinetry. Enduro Clear Poly is self-sealing but can also be used with General Finishes Sanding Sealer if desired. Exceptional durability and chemical resistance makes this an excellent choice for most residential and commercial applications. General Finishes Crosslinker can be added for enhanced chemical, abrasion & moisture resistance.